Business buyers broadly agree that thought leadership content impacts their purchase decisions at every stage of the buying process. 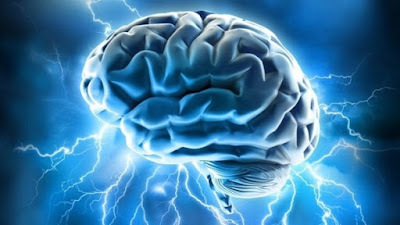 And recent research by Edelman and LinkedIn shows that the influence of thought leadership is growing. The research also shows, however, that thought leadership is a double-edged sword. In November of last year, Edelman and LinkedIn conducted a survey (the “2018 survey“) of U.S. business decision makers and purchase influencers to measure the impact of thought leadership content on B2B purchase decisions. The survey produced 1,201 responses from individuals representing a wide range of industries and company sizes. 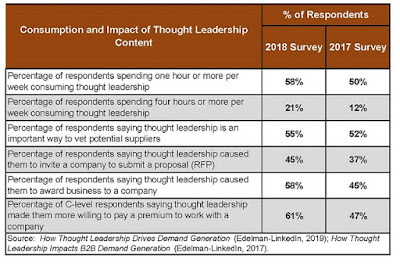 In this research, Edelman and LinkedIn asked survey participants several questions about how they use thought leadership content and how it affects their purchase decisions. Edelman and LinkedIn conducted a survey in October and November of 2017 (the “2017 survey“) that addressed many of the same issues. This type of “longitudinal” research can be particularly valuable because it reveals the degree and direction of change that has occurred from one survey to the next. 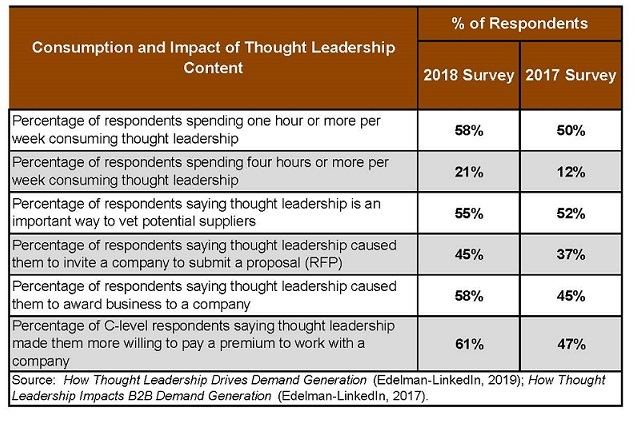 Several findings of the Edelman/LinkedIn research clearly demonstrate that the influence of thought leadership in the B2B purchasing process is growing. The following table shows how respondents in the 2018 survey and the 2017 survey described their consumption of thought leadership content and its impact on how they make purchase decisions. These findings clearly show that B2B decision makers are spending more time engaging with thought leadership content and that the impact of such content is growing across the entire B2B buying journey. 75% of survey respondents said they will start following a writer or organization based on their thought leadership, and 60% said they will stop following a writer or organization because of poor thought leadership. 92% of respondents said thought leadership has increased their respect for an organization, and 46% said that poor thought leadership has decreased their respect for a company. 58% of respondents said they have decided to award business to a company because of its thought leadership, and 29% said they have decided not to award business to a company because of poor thought leadership. As the table shows, B2B decision makers don’t believe the quality of thought leadership has improved since 2017. While the percentage of excellent or very good thought leadership increased (18% in 2018 vs. 14% in 2017), the percentage of good content decreased (53% in 2018 vs. 60% in 2017), and the percentage of mediocre to very poor content increased (30% in 2018 vs. 26% in 2017). The most important lesson for B2B marketers in the Edelman/LinkedIn research is this: There is no safe middle ground when it comes to thought leadership. 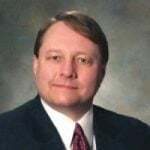 Great thought leadership makes a positive impact on buyers at every stage of the buying process, but poor thought leadership results in lost business opportunities.